, a poetess and literary lady of considerable celebrity, was the daughter of the rev. Thomas Seward, rector of Eyam in Derbyshire, prebendary of Salisbury, and canon residentiary of Lichfield. In his youth he had travelled as tutor with lord Charles Fitzroy, third son of the duke of Grafton, a hopeful young nobleman, who died upon his travels in 1739. Mr. Seward returned to England, and soon after married Miss Elizabeth Hunter, daughter of Mr. Hunter, head-master of the school at Lichfield, the preceptor of Johnson, and other eminent nterary characters. Mr. Seward, upon his marriage, settled at his rectory of Eyam. In 1747, the secoud year of his marriage, Miss Seward was born. Mr. Seward was himself a poet, and a contributor to Dodsley’s collection; he was also an admirer of our ancient drama, and in 1750 published an edition of Beaumont and Fletcher’s plays. Thus accomplished himself, the talents of his daughter did not long escape his observation, and tinder his instructions she laid the foundation of a taste for | poetry. The authors he recommended to her were those of queen Anne’s reign. She wasea.ly familiar with Pope, Young, Prior, and their predecessor Dry den, and in later life, used to make little allowance for poetry of an uider date, excepting only that of Sbakspeare and Milton. The desire of imitating the compositions which gave her pleasure, very early displayed itself. She attempted metrical versions of the Psalms, and even exercised herself in original composition, before she was ten years old. An “Address to the first fine day of a backward spring,” which has been preserved, intimates considerable command of numbers and language, though the ideas cannot be called original. About 1754, Mr. Seward removed with his family to Liehfield, which continued ever afterwards to be his daughter’s residence, although varied, during her father’s life, by occasional visits to his rectory at Eyam. For the first ten years of Miss Seward’s residence here, she was^rather checked than encouraged in the cultivation of her poetical talents. Her mother possessed no taste for her daughter’s favourite amusements, and even her father withdrew his countenance from them, under the apprehension that his continued encouragement might produce in his daughter that dreaded phenomenon, a learned lady. Poetry was therefore prohibited, and Miss Seward resorted to other amusements, and to the practice of ornamental needlework, in which she is said to have excelled. When, however, she arrived at an age to select her own society and studies, her love of literature was indulged, and the sphere in which she moved was such as to increase her taste for its pursuits. Dr. Darwin, the enthusiast Mr. Day, Mr. Edgeworth, sir Brooke Bootbby, and other names, well known in the literary world, then formed part of the Lichfield society. Dr. Johnson was an occasional visitor in their circles, but not much of a favourite with Dr. Darwin or Miss Seward. He neither agreed with the one, nor flattered the other. 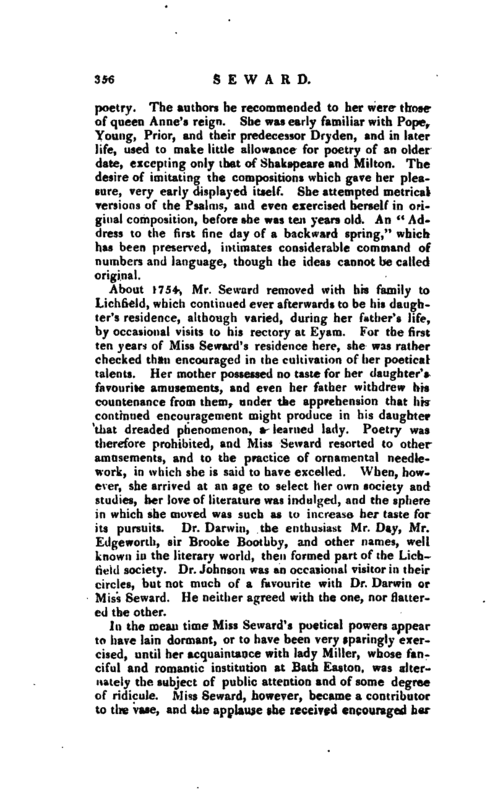 In the mean time Miss Seward’s poetical powers appear to have lain dormant, or to have been very sparingly exercised, until her acquaintance with lady Miller, whose fanciful and romantic institution at Bath Easton, was alternately the subject of public attention and of some degree of ridicule. 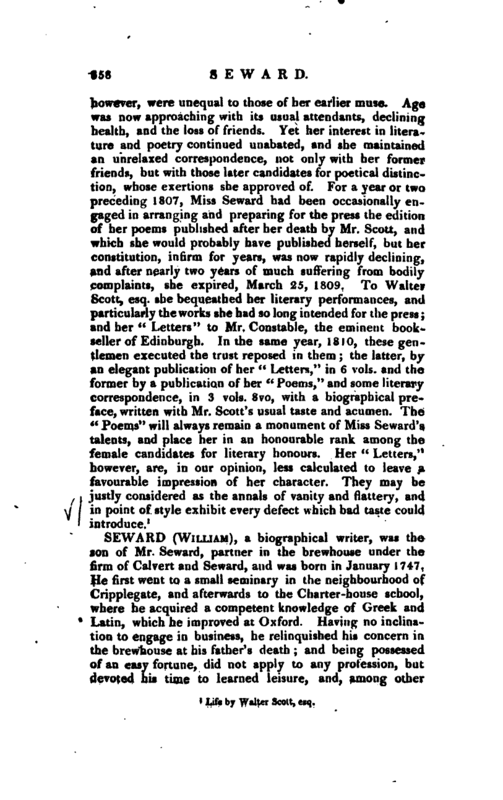 Miss Seward, however, became a contributor to the vase, and the applause she received encouraged hec | to commit some of her essays to the press, particularly her poems on major Andre and captain Cook, which were received hy the public with great favour, and certainly were calculated to couvey a very high impression of the original powers of their author, and procured her the admiration and correspondence of many of the most distinguished literary characters of that time. 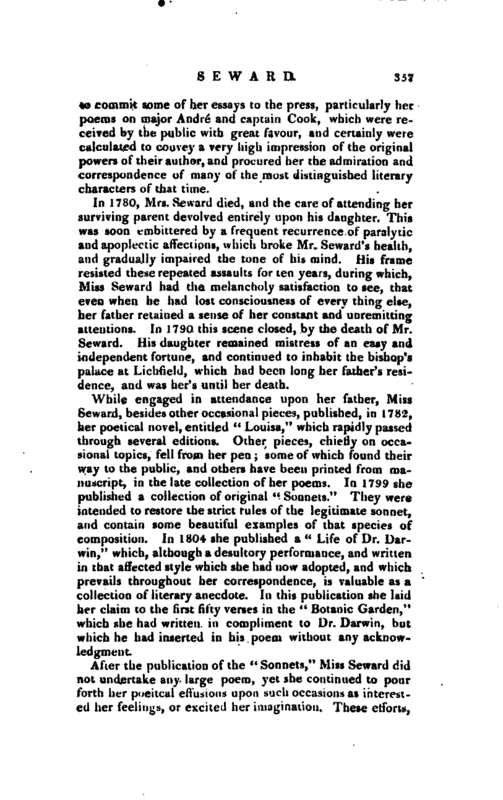 In 1780, Mrs. Seward died, and the~are of attending her surviving parent devolved entirely upon his daughter. This was soon embittered by a frequent recurrence of paralytic and apoplectic affections, which broke Mr. Seward’s health, and gradually impaired the torje of his mind. His frame resisted these repeated assaults for ten years, during which, Miss Seward had the melancholy satisfaction to see, that even when he had tost consciousness of every thing else, her father retained a sense of her constant and unremitting attentions. In 179O this scene closed, by the death of Mr. Seward. His daughter remained mistress of an easy and iudependent fortune, and continued to inhabit the bishop’s palace at Lichfield, which had been long her father’s residence, and was her’s until her death. 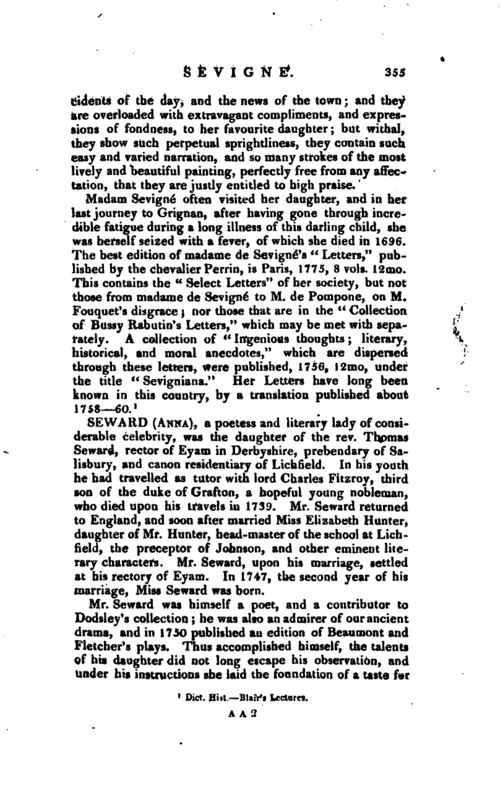 While engaged in attendance upon her father, Miss Seward, besides other occasional pieces, published, in 1782, her poetical novel, entitled “Louisa,” which rapidly passed through several editions. Other pieces, chiefly on occasional topics, fell from her pen; some of which found their way to the public, and others have been printed from manuscript, in the late collection of her poems. In 1799 she published a collection of original “Sonnets.” They were intended to restore the strict rules of the legitimate sonnet, and contain some beautiful examples of that species of composition. In 1804 she published a“Life of Dr. Darwin,” which, although a desultory performance, and written in that affected style which she had now adopted, and which prevails throughout her correspondence, is valuable as a collection of literary anecdote. In this publication she laid her claim to the first fifty verses in the “Botanic Garden,” which she had written in compliment to Dr. Darwin, but which he had inserted in his poem without any acknowledgment. Life by Walter Scott, esq.